25 cars were entered for the F2 European Championship round at Rouen. Only 20 were permitted to start, so it would be interesting to see who would miss out. Two one-and-a-half-hour sessions were scheduled for both Thursday and Friday. A sweltering Thursday was used to dial the cars into the circuit, with 1m 50s the benchmark. Faster times were expected for the cooler Friday session, and quickly the fast men got down into the 1m 47s times. Jean-Pierre Jabouille finished up on pole, his Elf-Schnitzer going round in 1m 47.28s. Close behind was Patrick Tambay in a works March 752 with a 1m 47.39s time, just 15/100ths of a second faster than team-mate Michel Leclerc. Run-away championship leader Jacques Laffite in his Martini-Schnitzer was the only other runner below 1m 47s with a 1m 47.77s time to round out the 2nd row. These four were clearly the class of the field, with 5th place Claude Bourgoignie’s March 752 almost 2 seconds slower than Jabouille on 1m 49.14s. Maurizio Flammini was next in his March-BMW 742 with 1m 49.71s, Jean-Pierre Beltoise, filling in for Gerard Larrousse qualified 7th with 1m 49.82s and Gabriele Serblin in his March 752 was 0.01s slower in 8th. The top ten was rounded out by Harald Ertl’s Chevron-BMW B29 and Willi Deutsch in a Warsteiner March-BMW. The award for bravest driver of the weekend went to Giorgio Francia. The Osella driver had managed 11th fastest time, when he had one of the most spectacular accidents yet seen at a circuit well known for its dangers. On the downhill first corner after the pits, as he accelerated down the hill, his car suddenly snapped left and into the Armco. The Osella bounced off and barrel-rolled 200 yards down the road, then launched itself over another piece of barrier, crashed through a wooden marshall’s post, and dropped 20 metres into the ravine below. Grave fears for Francia’s life were allayed when the Italian crawled out, miraculously with what appeared to be a cut arm! Soon afterward he announced he would drive the spare car in the race, but the decision was made for him when it was found he had actually fractured his wrist. The Osella was completely destroyed, and was buried so far down into the ravine that you wouldn’t have even known it was there if you hadn’t been told! Xavier Lapeyre in the Chevron-Simca B29 thus moved up to take Francia’s spot on the grid, followed by Bruno Pescia in the March-Schnitzer, the late-arriving Jean-Pierre Jassaud well back in Brian Henton’s March, Sandro Cinotti in a Project 4 March, Alberto Colombo’s March, Jo Vonlanthen in another March, Bernard de Dryver, Christian Ethuin’s Chevron and Max Bonnin. The 40 laps of the 25th Grand Prix de Rouen got away under sunny skies on Sunday afternoon, Jabouille leading down to des Roches for the first time, followed by Leclerc, Tambay and Serblin who had made an excellent start. 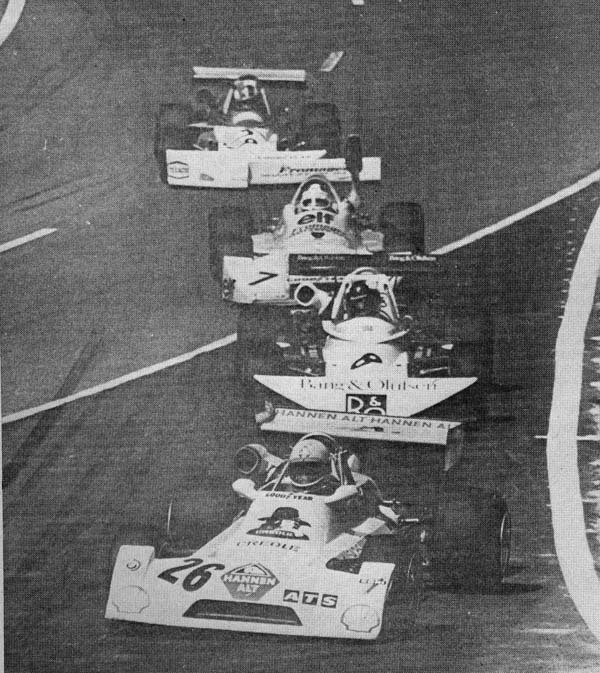 By the end of the lap Leclerc was right on Jabouille’s tail, while Laffite had got back past Serblin for 4th. Leclerc muscled past Jabouille on lap 3, leaving the Elf driver to fall back into the clutches of Tambay and Lafitte. By lap 4 Leclerc had opened his lead out to 2 seconds over the other three, with Serblin already a full 10 seconds further back in 5th. On lap 12 Lafitte was the first of the big four to strike trouble: a tap on the back of Tambay had made his steering very dodgy, and he pitted to see if anything could be done. Leclerc meanwhile had rocketed 6.5s up the road. Shortly afterward Jabouille, who had been struggling with an oil leak from early on, headed into retirement when his engine finally gave up. So from there it was a procession for Leclerc, the 1972 Rouen F3 winner cruising home 9 seconds clear of team-mate Tambay for a works March 1-2. Behind the frontrunners a far more interesting race took place. Serblin was 20 seconds behind after 14 laps, with Ertl leading Bourgoignie, Beltoise and Flammini. Next came Jassaud, de Dryver, Deutsch, Vonlanthen and the slowing Pescia. Both the ROC Chevrons were already out, Bonnin’s car let him down on the opening lap, and Colombo was unlucky when he came upon the spinning de Dryver and hit the Armco taking avoiding action. Ertl dropped out with a severe engine vibration shortly afterward, while further back Laffite was going as fast as he could to catch up after having his steering sorted out. Flammini’s afternoon came to and end, his driveshaft failing, and Deutsch and Vonlanthen retired after Deutsch spun letting Leclerc through and Vonlanthen collected him. 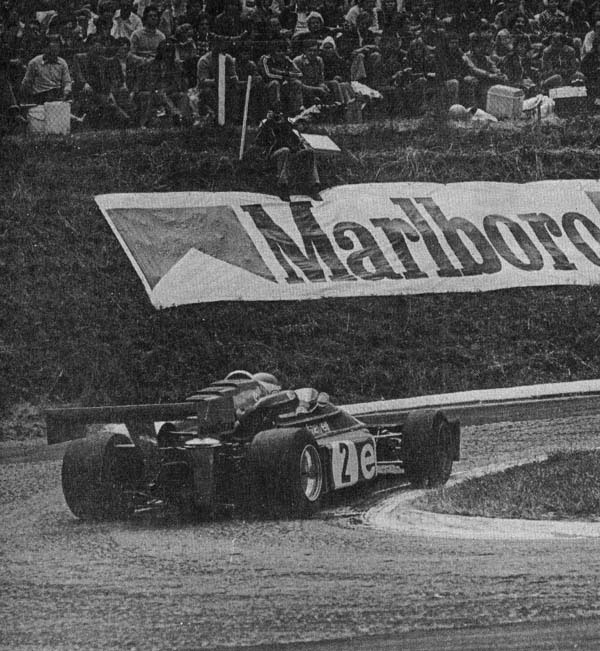 Beltoise’s engine expired as he pressured Bourgoignie, leaving the Belgian to close on the struggling Serblin. Serblin’s rear wing had started ruptured the gearbox due to the immense downforce it created, and Bourgoignie was past after Serblin’s car finally decided enough was enough and the rear burst into flames. That’s how they stayed, Bourgoignie coming home third despite gearbox problems towards the end with the fast-finishing Jassaud in 4th and the last driver on the lead lap. De Dryver was 5th one lap down, while Serblin was classified 6th, 5 laps adrift, Flammini 7th 6 laps down, and Laffite 8th, 12 laps down after a forgettable afternoon.